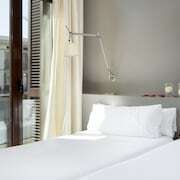 With a stay at Hostal Bcn Ramblas, you'll be centrally located in Barcelona, steps from Las Ramblas and Boqueria Market. This hostal is close to Palau de la Musica Catalana and Casa Batllo. Make yourself at home in one of the 8 air-conditioned rooms featuring LCD televisions. Complimentary wireless Internet access is available to keep you connected. Private bathrooms with showers feature rainfall showerheads and hair dryers. Conveniences include phones, as well as safes and desks.